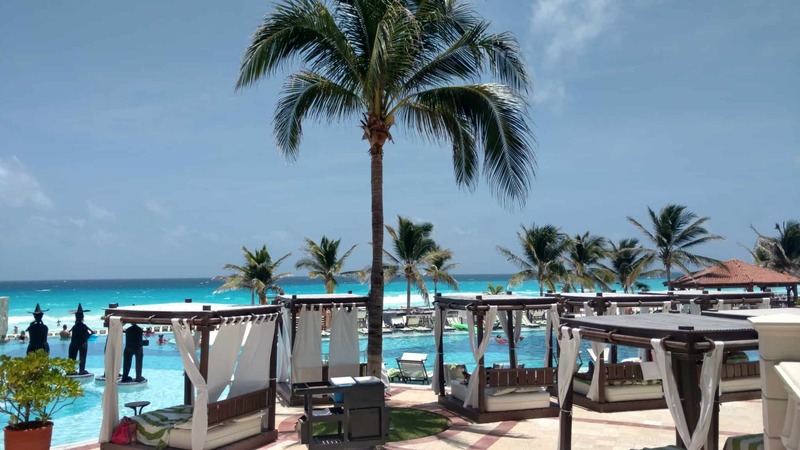 Mrs. Frugal Rules and I recently returned from a six-night stay at the Hyatt Zilara Cancun. We were there to celebrate our 15th anniversary and after the past six months of craziness in our lives it was exactly the kind of trip we needed and wanted. 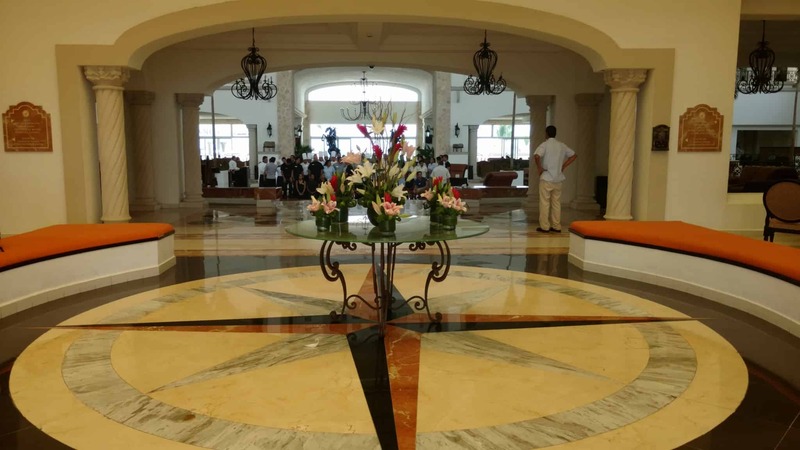 The Hyatt Zilara was the first all-inclusive resort we’ve stayed at. Having taken several cruises in the past, we were expecting something similar. While there were some similarities, I’d have to say that we enjoyed our time at the Zilara considerably more and look forward to going back in the future. Now that Southwest flies to Cancun, getting there is relatively simple. We flew from Omaha to Denver and then on to Cancun. 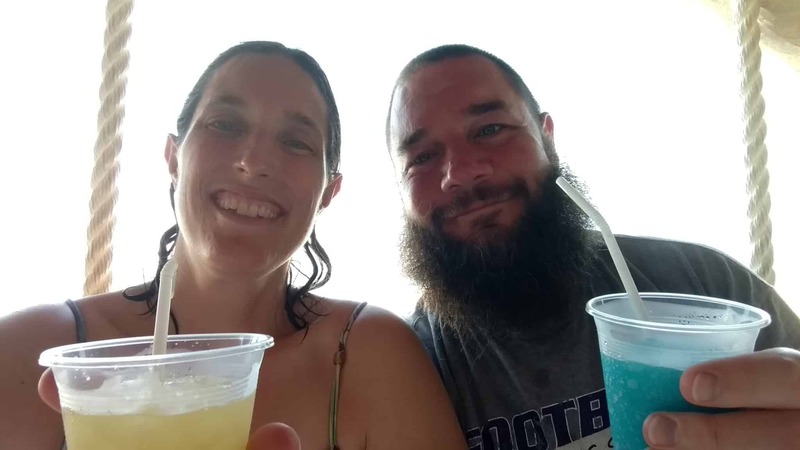 We were able to score a relatively cheap ticket at 25,992 miles for myself, while Mrs. Frugal Rules traveled for free using my Southwest Companion Pass. We paid a total of $206.92 in taxes, fees and EarlyBird Check-Ins. Without the miles and Companion Pass, the flights would’ve cost us $1,021.16 in full. The rack rate for a standard room at the Hyatt Zilara is $980 per night. Even though the standard room is a suite, there’s no way on earth I’m going to plunk down near $1,000 to stay in any hotel for one night. We did two things to radically cut down those costs. First, we both got the Hyatt Chase Credit Card. The sign-on bonus on the card gives you a free two-night stay at any Hyatt property in the world. That got us four nights for free. You can find that card, and other cards like it here. For the other two evenings we were able to score a 55 percent off promotion so we only had to pay $441 per night for the remaining two nights. 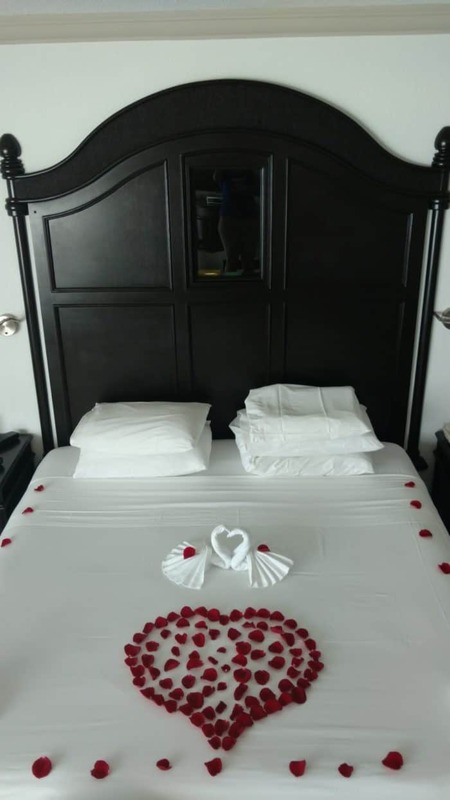 This brought the total cost of the lodging to $972.16 (which included a few extra things at the resort and $1,349.08 for the trip when we added in tips and transportation to and from the airport here in Omaha as well as the above mentioned Southwest cost). I’m estimating that we saved roughly $5,550 on the trip through travel hacking and deals as a similar trip would’ve cost over $6,900 at full price. We did look at the possibility of using Ultimate Rewards points to pay for the other two evenings. However, with the Hyatt Zilara being all suites it would’ve cost us 80,000 points total. Given Chase’s new 5/24 rule making UR points a bit harder to come by, we decided we’d rather keep the points and spend the money. The Hyatt Zilara is located in the hotel district, or zona hotelera, in Cancun and is located about a 20-30 minute car ride from the Cancun airport. We booked our transfers with UR points and the process at the airport was relatively straightforward. Granted, I don’t have much to compare it to, but the Hyatt Zilara is a pretty impressive resort. 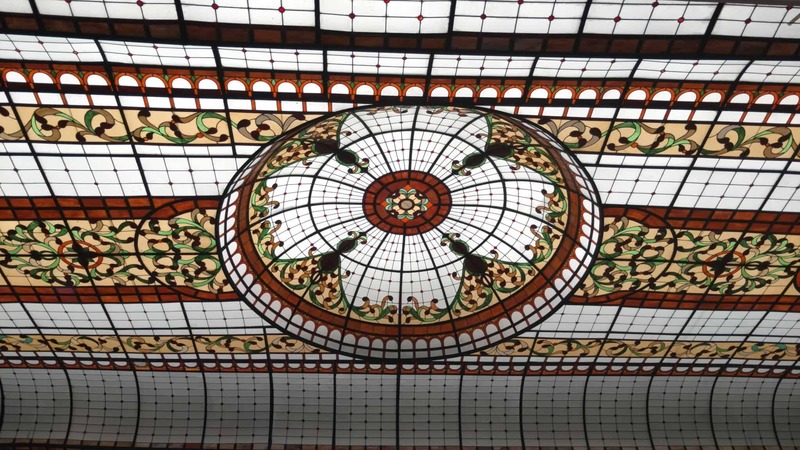 The check-in area is bedecked in fresh flowers and ornate glasswork on the ceiling, as you can see below. Beyond the check-in area is a spacious open-air lobby. 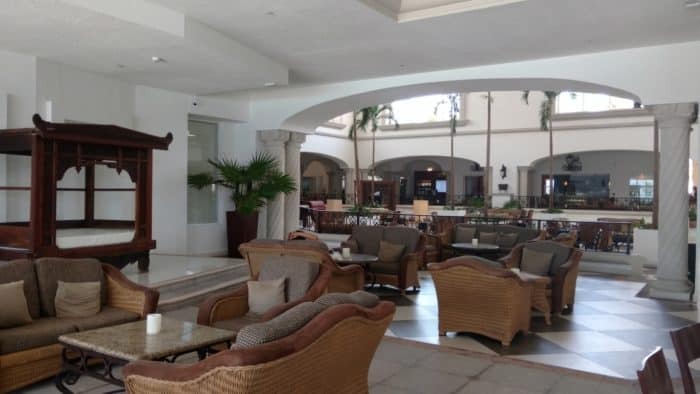 The lobby houses the buffet restaurant, bar, large sitting area and gift shop – with other items of interest around the perimeter. Check-in was a breeze for us, thanks to having Platinum status through the Hyatt card. Platinum Hyatt members get whisked off to an office to be checked in by a Romance Concierge. There we were offered drinks and a more personalized check-in process. They did offer us an upgrade to the Presidential Suite, which would’ve cost us an additional $1,100 for the trip. 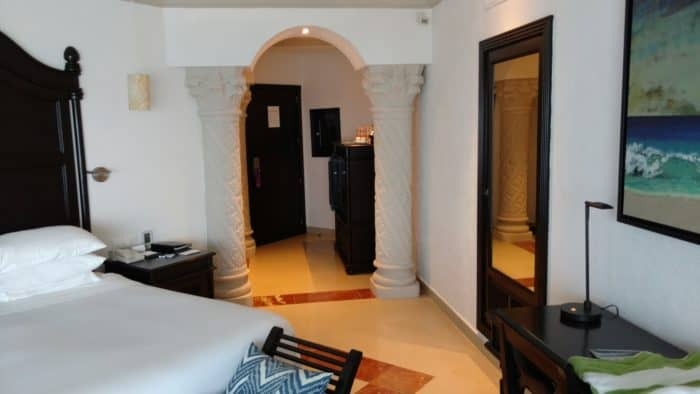 Knowing that we’d likely not be spending that much time in the room, and not wanting to spend that much we passed, and upon mentioning we were there for our 15th anniversary, they gave us a complimentary upgrade to the next level room – a Premier Zilara Junior Suite. It’s roughly the same size as the base room though provides a supposedly better view (though honestly, all the room views seemed pretty nice). 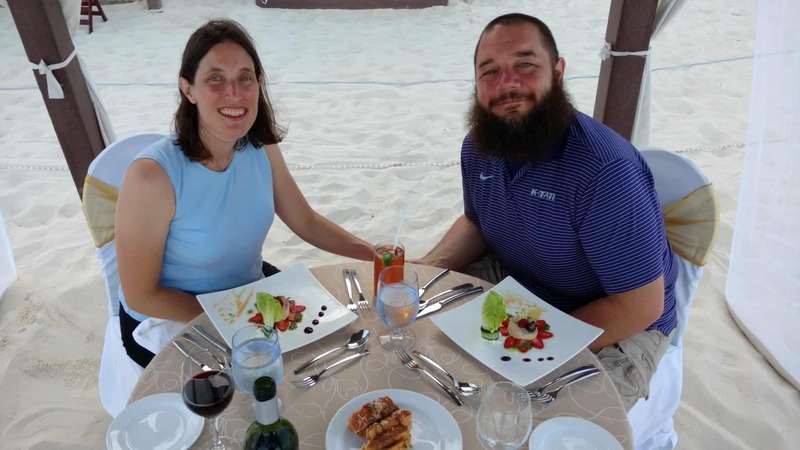 With the upgraded room, we also gained access to their high end six-course dinner restaurant – Chef’s Plate as well as a romantic dinner on the beach, which you can see below. We had wanted to try and get one of their swim up suites, but they were all booked during our stay. The room itself was a good size at just under 700 square feet. It comes with a balcony with two chairs and a hammock, a two-seater Jacuzzi, desk (though who works when staying at a place like this? 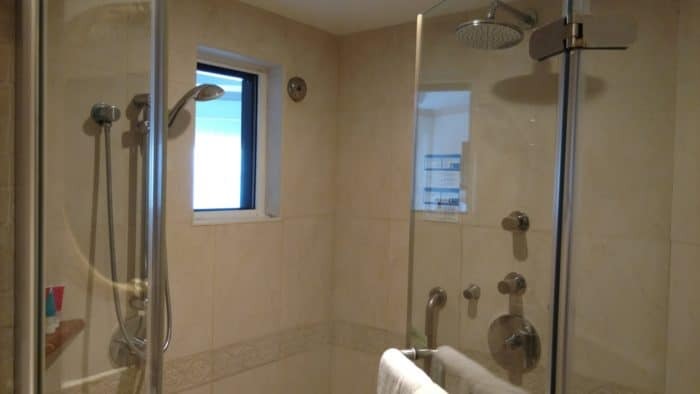 ), a good-sized bathroom with a large shower with two shower heads and a separate vanity area. There is also a nice mini-bar fridge area, which you’ll also see below. 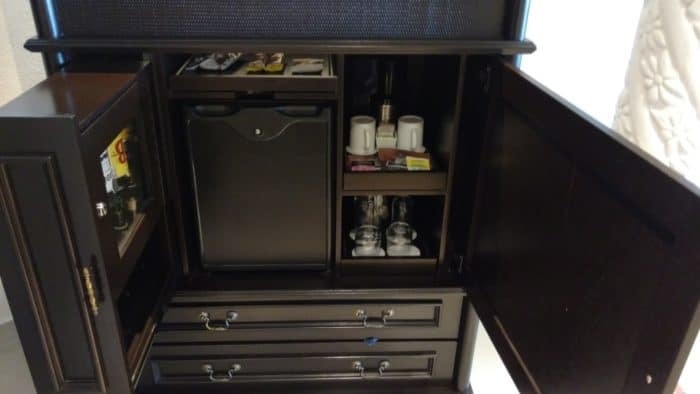 The cool part of the mini-bar was the pull out dispenser with four types of liquor. After figuring out how it worked, it was a nice little feature to have. 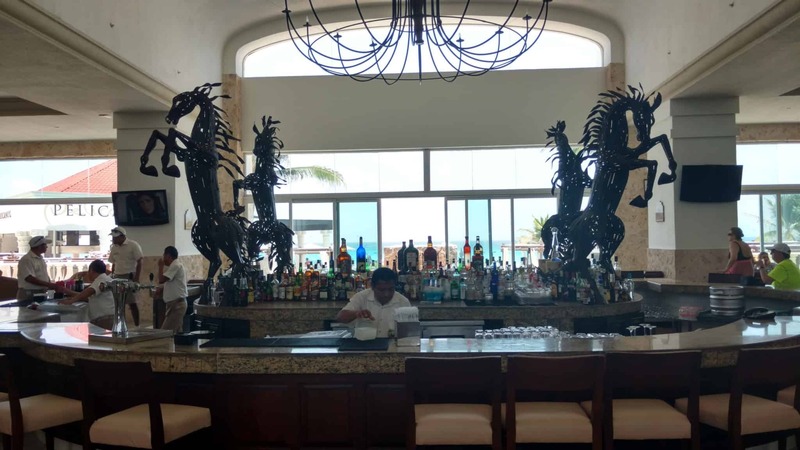 Pelicanos – This is an open-air restaurant right on the beach. 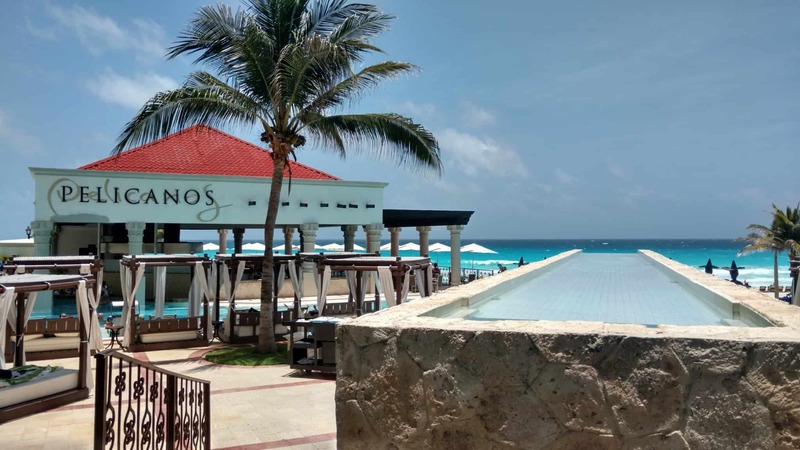 The food was decent and we ate there the most – largely for the view as it’s right on the beach and you get to overlook the Caribbean Sea. You can find pretty much anything you want at Pelicanos. Maria Marie – Maria Marie offers higher end Mexican food. We ate there 1-2 times and really enjoyed it. Asiana – You need reservations to eat at Asiana for dinner. But, after looking at the dinner menu we knew we’d prefer to eat there for lunch. Asiana offers Japanese and Korean dishes and the food was excellent. La Adelita Cantina – This is connected to Maria Marie and offers more Mexican food and higher end tequilas and mezcal. We ate there once and really enjoyed it. Chef’s Plate – This is the aforementioned six-course restaurant mentioned previously. Reservations are required and you sit family style in a room that seats 12-15. You need to be in a Premier Junior Zilara Suite or higher to be able to get reservations. The resort has an ample amount of pools and plentiful access to the beach. There are pools dedicated for volleyball, one more meant for swimming and several infinity pools. Pro trip – if you want an infinity pool, go to the one connected to the gym. 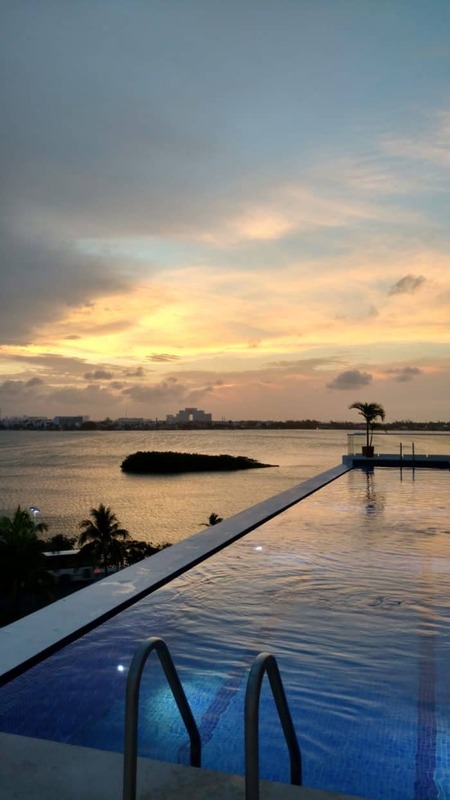 It provides a great view of the sunset and it’s hardly used – from our experience at least. There are a handful of rooms that have swim-up suites. They’re not really private but you can use them 24/7, which could be a nice feature to enjoy. There are plenty of cabanas, as you can see in the picture. If you have a high enough Hyatt status you get a reserved cabana. I had read that cabanas were hard to come by around the pool. While some were cherry picked early in the morning, we never had a problem finding at least a couple around the pool. If all else fails, there are plenty of cabanas available on the beach. The beach was filled with soft, white sand, which I understand is shipped in. Regardless, it was still pretty and the water was gorgeous. Thankfully we had little rain while there so got to enjoy the water everyday. I wasn’t aware of this when we booked the hotel, but the Zilara puts on evening shows usually every other night. Cirque Du Soleil, they’re not, but is a nice touch to have. They were always in the lobby and we found that many guests staked out their seats 1-2 hours in advance to get a full view so if shows are important to you, keep that in mind. There was also a different house band each evening at the main bar. Some evenings they were really good and other evenings they were mediocre. No complaints though as live music was an unexpected pleasantry. The other nice feature was the gym. We managed to work out four days while there and usually had the gym all to ourselves. The Hyatt Zilara also offers numerous classes to take so you’re hard pressed to not get some sort of activity in while staying there. You can also book a fair number of excursions through the hotel. 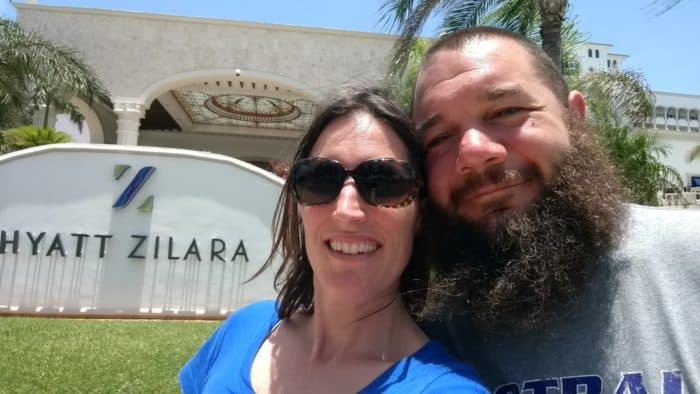 We booked one snorkeling trip prior, using UR points to pay for it, but otherwise didn’t leave the hotel as this was a trip where we intentionally wanted to simply and solely relax. Overall we absolutely loved our stay at the Hyatt Zilara. After the craziness of the past six months and dealing with the loss of my Dad in December it was exactly what we needed. We got to completely unplug. No computers were taken. Mrs. Frugal Rules left her cell phone at home and we had mine in the event that her parents had to call us with a question about the kids. It was put in the safe in our room and taken out once a day to make sure they hadn’t tried to reach us. Suffice it to say, unplugging was one of the best parts of the trip. The only real complaint we had about the property was some of the employees associated with the resort. They’d approach us to give a hard sell on coming to a breakfast where we’d give them names of our friends in exchange for a free two- night stay. The resort is more than nice enough to sell itself so it’s not really necessary in my opinion. That aside, we didn’t have any other complaints and had a blast at the resort. Having done both cruise and all-inclusive I’m pretty confident that we’ll be doing the latter and not the former from now on as we enjoyed it much more. 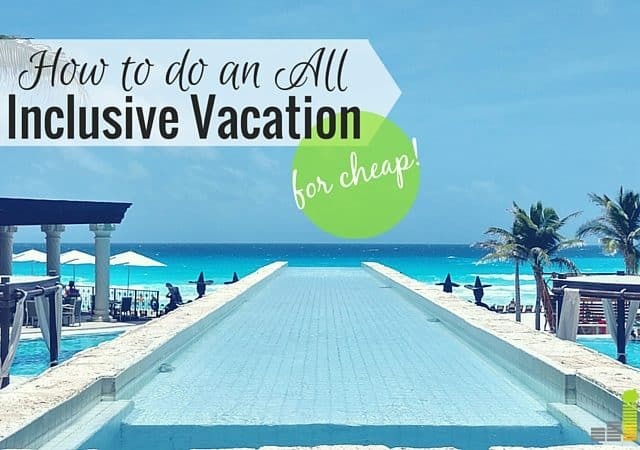 Have you ever stayed at an all-inclusive? If so, what was your experience? How important is it to you to unplug on vacation? What travel plans do you have for the rest of the year? Happy Anniversary! And epic beard, btw. Sounds like you guys had fun and it looks like a great place to go on vacation. Ha ha, thanks DC! It was definitely a blast. Happy anniversary! Wow! Thanks for sharing your vacation pictures – it looks like an amazing trip! 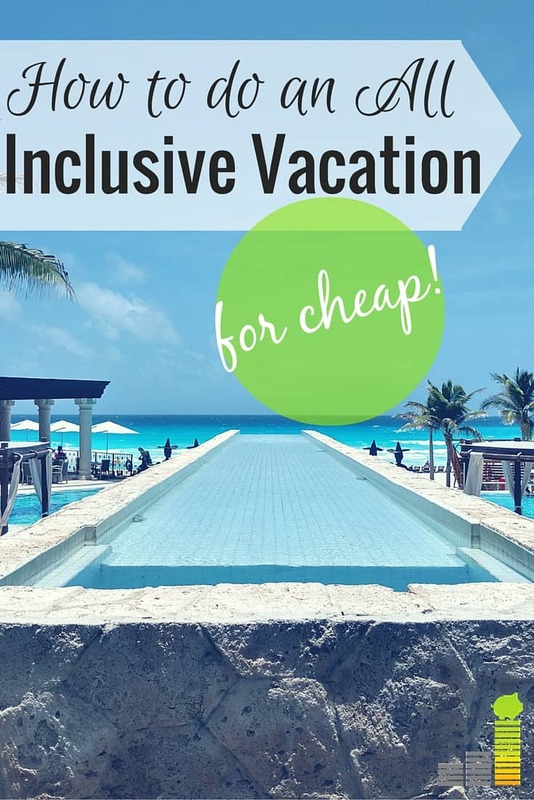 We’ve never done all-inclusive, but you may have me convinced to give it a try. Unplugging is such a great idea – I’m going to give it a try when we take off on vacation this summer. I was debating on taking a laptop, but your story has convinced me otherwise. Thanks Amanda. I didn’t know what to think of it before we went, but we had an absolute blast. There were so many things to do, not to mention relaxing, that you could find something to do all the time. You definitely should. I’m 50/50 on whether or not I take my laptop but this trip was solely to relax. If I would’ve had it then I wouldn’t have allowed myself to relax. We came back from Zilara on May 22. It was a great resort and we got upgraded to the premium as well by asking for a complimentary upgrade. Our hotel price for 4 nights was $2k CAD. Flying from Toronto…flight was $1500 CAD. I thought the staff was excellent and appreciated that we were actually there. Loved the beach cabanas and spent most of our time there. Very cool Shane! We left on the 21st ourselves. Completely agreed on the staff – they were excellent and genuinely seemed to care to provide great service. 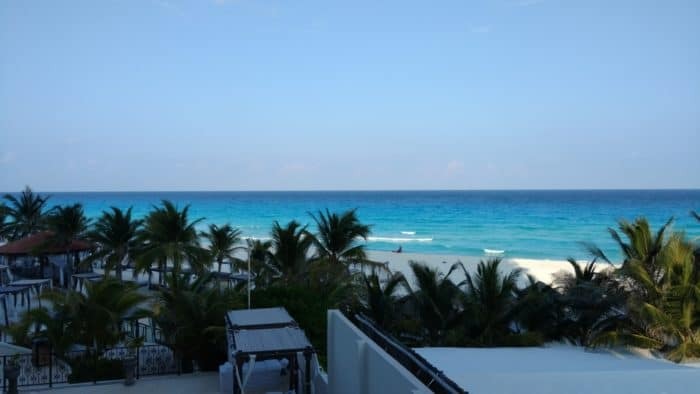 We love Cancun and once you have done an all-inclusive you realize it is the best way to vacation. We stayed in the same area on our last trip down there. I ran 5 miles every morning and still gained 11 pounds at the end of 10 days down there. Totally worth it. 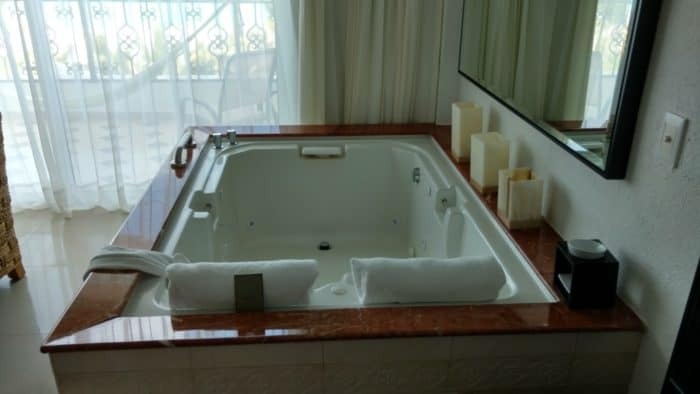 I remember our first trip to one of the hotel restaurants and my wife couldn’t decide what to order for dessert and the waiter said, “well I’ll just bring them all out for you and you can have them all!” We had a full size hot tub in our room next to the bed. We met a man from Europe who pays $30,000 a year to stay for 10 weeks. Everyone has to do it at least once, but you will end up doing it again. I can imagine that you’d gain weight as I gained a few pounds. Sounds like you had a great time! Lovelyyy! We went there for our honeymoon last June and it was amazing. We stayed in Secrets The Vine which I thoroughly recommend! Happy Anniversary! Looks like a great trip. I’m always impressed by Hyatt locations…didn’t know there was an all-inclusive option. The 700 square foot suite is especially impressive…that’s probably bigger than my old apartment! I’ve gone to all-inclusive resorts in my younger days but they were not nearly as nice as this Hyatt. Free food and drinks were awesome though. That it was Andrew! Yea, they have a few all-inclusives, but not many. The ones I’ve seen though are pretty killer. Just wondering, did you feel safe in the area? I love Cancun and used to travel there often, but have heard it’s become more dangerous with drug cartel. I love the all-inclusive way to travel. No worries. Good question Jennie. To be honest, besides to/from the airport we only left the resort once to go snorkeling so I don’t know that I’m the best one to answer that. 🙂 That being said, they didn’t say anything at the resort so I probably wouldn’t have a problem with going out some.